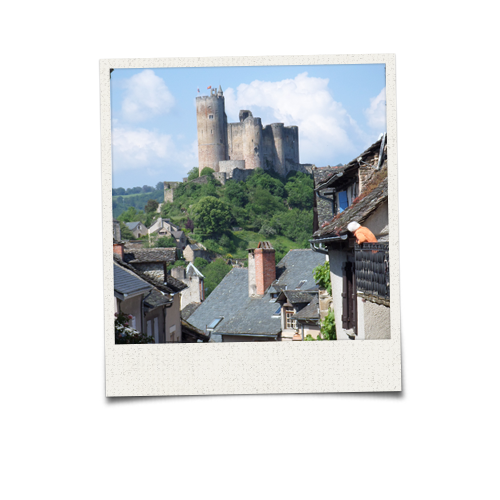 Najac is one of the officially designated “Plus Beaux Village de France" (most beautiful villages of France) and a “Grand Site de Midi-Pyrénées” - a picturesque mediaeval bastide (fortified village or town) it rests along a ridge above a bend in the Aveyron River. The partly ruined château built in 1253, dominates the setting with the 13th century Eglise Saint-Jean, built by the villagers under duress as a punishment for their Cathar beliefs, just below. Both overlook the lower village with its shops, artisan workshops and places to eat. In the upper village the Faubourg has timber framed buildings, and arcades with cafés, shops, restaurants all grouped around a central square. Immediately below the village, on the banks of the Aveyron river, you will find the municipal swimming pool, just minutes from La Singlarie. Opposite, over the bridge, bikes, kayaks and canoes can be hired. There is a new acro-branch centre at the same location for children (and adults!) to test their skills in the treetops, under supervision, and with the latest safety equipment. There is a bar and restaurant for pre/post activity refreshments. Shaded picnic areas can be found along the banks of the river. Najac has an excellent general store “l'Epicerie du Coin” run by the delightful Marie-Agnes and her partner Laurent; a little further away (15 minutes from the farm) there is an Intermarche supermarket with all you would need for a weekly shop, plus a service station for fuel. Villefranche de Rouergue is the nearest large town. A mediaeval bastide, the town has all the additional amenities you would expect, with a wide range of restaurants, three large supermarkets, a very large weekly market, golf, swimming pool, plus much more. 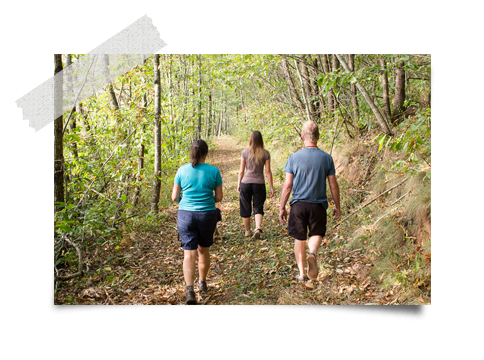 Local walks (including within the farm boundaries) wind through beautiful countryside, from a leisurely stroll through to a demanding hike. Walking guides are available within each gite and we will be pleased to give advice. The Viaur River (20 minutes) provides a terrific location for swimming and play for adults and children in a beautiful setting. There is a bar/restaurant serving food all day during the summer with live jazz music in the evening. For those of you who are really adventurous, rock climbing is also available. 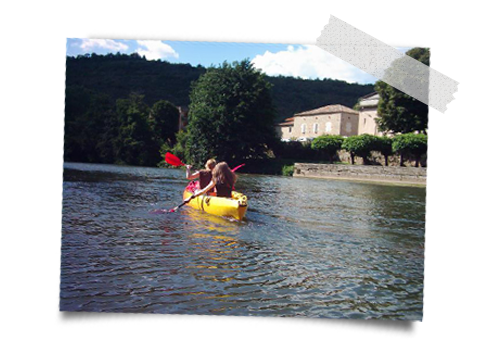 At Laguepie (15 minutes) The rivers Aveyron and Viar converge – A large inflatable pontoon (like a bouncy castle on water) with a lifeguard gives children plenty to do. The village has a good selection of restaurants and cafés and picnic areas. Horse riding is available 5 minutes from La Singlarie at La Ferme Doudou, also at Najac (Vacance Blue) and Monteils (both 15 minutes). II Capello Pizzeria - Well priced pizzas and Italian/French dishes. Belle Rive - Set menus and a la carte including vegetarian. Lovely setting on the terrace. L'Oustal del Barry - Quite formal to dine inside, relaxed on the terrace with a good value set menu for lunch and a very wide choice. La Salamandre - Tradional Aveyronaise cooking. 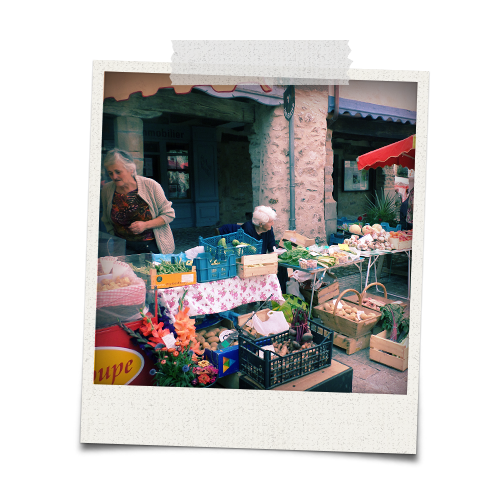 Najac – Sunday during spring and summer, also night markets during July and August with entertainment and tables set out in the main squares, surrounded by stalls selling a terrific variety of food and drinks. This area of France benefits from an abundance of natural beauty, places of historic interest, cultural centres, fascinating villages and towns. The city of Albi (50 minutes) home to a spectacular cathedral and enthralling history, plus the Toulouse Lautrec museum, great shopping and restaurants. The town of Gaillac (45 minutes) is a lively town with a signposted route through the vineyards to visit and taste the wines. Cordes-sur-Ciel (30 minutes) also a “Grand Site de Midi-Pyrénées” winds around a conical hill with panoramic views, plenty of places to eat and drink and artisan workshops. 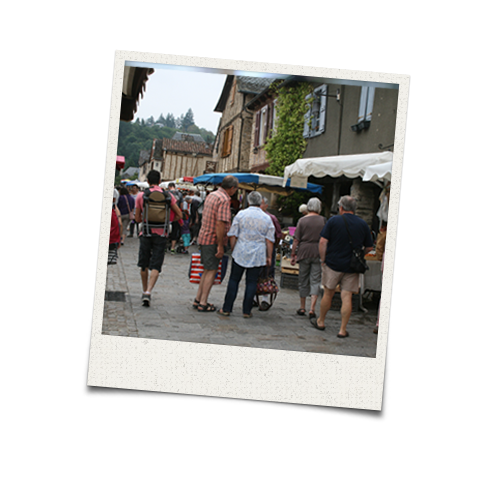 St Antonin Noble Val (30 Minutes) a bustling mediaeval town on the banks of the Aveyron with kayaks and bikes for hire, restaurants, bars and cafés and its ever popular Sunday market. Saint-Cirq-lapopie a “Plus Beaux Village de France"(50 minutes) with its position, originally selected for defence, perched on a steep cliff 100metres above the river has helped make the town one of the most popular tourist destinations in the Lot. Belcastel a “Plus Beaux Village de France"(40 minutes) is a very well kept village with a Michelin starred restaurant. The Millau viaduct (2 hours) designed by the French structural engineer Michel Virlogeux and British architect Norman Foster, it is the tallest bridge in the world. The visitors centre is well worth seeing and the town has a great range of shops restaurants and cafés. Please feel free to contact us at any time for more information.